“Seymour: An Introduction” comes out on DVD this week and is streaming on Netflix. This review is taken in part from my original theatrical review for the Cap Times in April. “Seymour: An Introduction” opens with 87-year-old pianist Seymour Bernstein figuring out a difficult passage of music. Playing the same few bars over and over, he has to strategize, figure out where he needs to put his fingers and when, to make the difficult transition from this chord to that. Finally, after a lot of trial and error, he gets it right. To the casual listener of the final performance, of course, it might sound like the music just flows out of Bernstein’s fingers. But, of course, it takes thousands of hours of practice to make that music “flow.” The documentary “Seymour” makes a powerful and poignant case for the hard, unglamorous work that goes into making great art, and that making that your life’s work makes for a life well-lived. 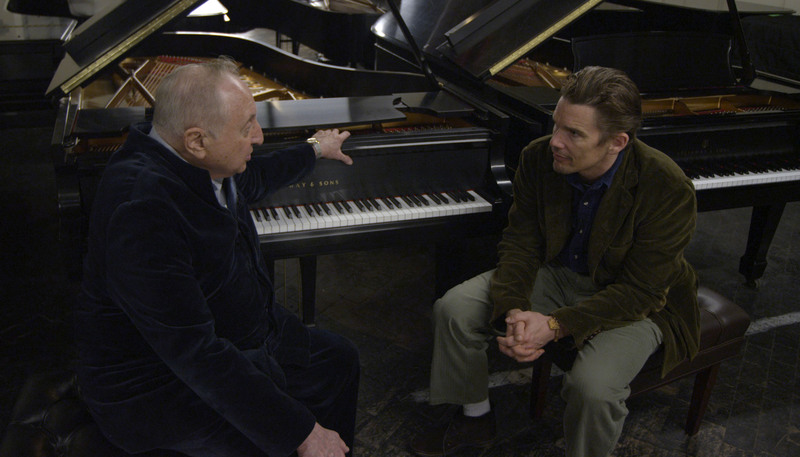 “Seymour” was directed by actor Ethan Hawke, who befriended Bernstein after the two were placed next to each other at a dinner party. As Hawke explains it on-camera, he confided to Bernstein that he was having a mid-career bout of stage fright, and couldn’t figure out how to stop being nervous. Bernstein replied wryly that most performers ought to be more nervous when they go on stage. The film is structured almost exclusively around interviews with Bernstein, whether he’s talking with Hawke, talking to his current and former students, or looking directly into the camera. His music and his life seem completely integrated with each other; he even speaks like he plays: thoughtfully, calmly, compassionately, perceptively. “Seymour” moves around in time, shifting from Bernstein’s interactions with young students today to his memories of growing up and serving in the Army, where he would play concerts on the front lines in South Korea for soldiers who had never heard classical music before. 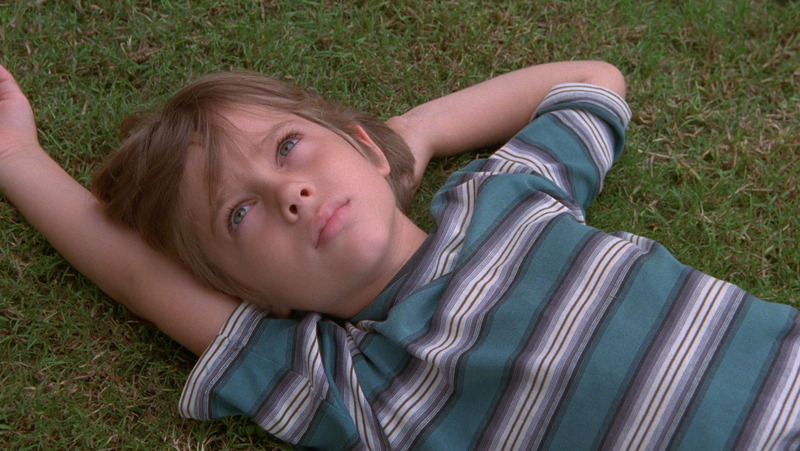 “Boyhood” opens Friday at Sundance Cinemas. R, 2:45, four stars out of four. Mad Film Forum will host a “Madfilm Meetup” at Sundance at 8 p.m., Tuesday, with a pre-party featuring cocktails and music at 6 p.m. at the theater’s Rooftop Bar. You could rate Richard Linklater’s new film “Boyhood” strictly on degree of difficulty, like an Olympic dive. Linklater has been making “Boyhood” since 2001, visiting the same group of actors each summer, adding more scenes as they grew older. Ellar Coltrane was six when he was hired to play young Mason , Lorelei Linklater (Richard’s daughter) was eight. The film is built around Ellar, and Linklater had no way of knowing what kind of actor he’d grow up to be. Embarking on such a project was a tremendous leap of faith for all parties. Or you can just look at the finished movie. By that standard, “Boyhood” is one of the best of the year, a funny, moving and realistic look at growing up, looking backwards and looking forward. It’s like a naturalistic, conversation-heavy response to Terence Malick’s ethereal “Tree of Life,” which also dealt with epic themes of childhood and parenthood in Texas. “Getaway” opens Friday at Point, Eastgate and Star Cinema. PG-13, 1:33, one star out of four. The good news about “Getaway” is that it always uses real cars and drivers. Unlike the CGI’d up action of other summer action movies, you can tell that those are real vehicles motoring at high speeds and bashing into each other. The bad news is that it does not always use real actors or writers. The utterly ridiculous storyline (even by car-chase movie standards) attempts to leap over Snake Canyon-sized gaps of implausibility, and has a hilariously miscast Selena Gomez in a key supporting role as foul-mouthed hoodrat hacker. Ethan Hawke, who has mouths to feed at home, plays Brent Magna, a failed race car driver living a quiet life in Bulgaria with his wife. But then she’s kidnapped by a mysterious villain (Jon Voight’s lips) who directs him to a souped-up, armored Shelby with cameras mounted on the inside and out. Over the course of one night, Brent has to drive that car and do everything that Jon Voight’s lips tell him to do, or Jon Voight’s lips will kill his wife. Of course, Jon Voight’s lips has a more nefarious scheme in the works, but nobody comes to a movie like “Getaway” for the plot. The film is the non-stop car chase delivery system as advertised, and while the chases are freneticallly, desperately edited to within an inch of their lives, that’s not the real problem. The real problem is director Courtney Solomon’s mystifying decision to use so much dashboard cams and other cruddy digital video, so that he’s cutting from one muddy, washed-out image to the next. Maybe he’s intending to capture the immediacy of a YouTube video, but it looks awful. Except for one scene that shows what might have been, a beautiful, rolling first-person shot that last several minutes of cars weaving and dodging through suburban streets at dawn. I’d like to think it’s an homage to Claude LeLouch’s short film “Rendez-Vous,’ which is poetry in fast motion. The rest of “Getaway” is clunky technical writing in motion. “Before Midnight” opens Friday at Sundance and Star Cinema. R, 1:48, three and a half stars out of four. Early on, we get the moment we’ve been waiting nine years for in “Before Midnight.” Jesse (Ethan Hawke) exits an airport in Greece after saying goodbye to his son, who lives in Chicago with his mother. Jesse walks out to his car — and there’s Celine (Julie Delpy)! With adorable twin 7-year-old girls sleeping in the backseat! They’re together! The happily ever after that fans of “Before Sunrise” and “Before Sunset” have been hoping for has finally arrived. And then the movie starts. And we see what exactly “happily ever after” entails. As someone who thought 1995’s “Before Sunrise” was a near-perfect romantic film about the possibilities of true love, and 2004’s “Before Sunset” was even closer to perfect, I was both thrilled by the news that Richard Linklater was making a third movie with Hawke and Delpy, as well as a little nervous. Could they sustain the romantic spell that the first two films had cast? The answer is not only no, but deliberately no. “Before Midnight” turns out to be a much tougher and more realistic film about relationships than its predecessors, and it’s quite a shock. If “Sunrise” was a film that was all about possibility, and “Sunset” was a film that balanced the possibility of what could be against the regret of what was, “Midnight” is very firmly more about regret. This couple, now 41, has been together for a while, and made choices to be together. And some of those choices still don’t sit well. On the drive home from the airport, Linklater settles into the familiar rhythms of the “Before” movies, using long takes as Jesse and Celine talk. The relationship seems good — they still have lots to say to each other, can still make each other laugh, still seem genuinely interested in each other. But underneath the banter you sense some buried issues that have never been quite resolved. For one, it seems like things got very messy after the closing credits of “Before Sunset.” Jesse left his wife for Celine, they had the twins almost immediately, and now the couple lives in Paris, Jesse hardly ever seeing his son. Meanwhile, Celine had to downshift her career to take care of the twins, and has a dream job offer in front of her. That opening conversation is a master class in saying things without saying them, as Jesse tries to float the idea of the family moving to Chicago, without actually floating it. The family comes to a gorgeous seaside Greek home, where they’ve been staying all summer. The film’s second big conversation is over dinner with friends, which is great, because for the first time we see Jesse and Celine really talking to other people rather than just to each other. The other couples at the table represent the different phases of love — a young couple, a middle-aged married couple, a widow and widower living with their memories. The topic at the table is the limits of love, surprisingly frank and downbeat on the subject of whether another person can make you truly happy, or if you inevitably settle for someone. This person may be the love of your life, but if life is so fleeting, how enduring can that love be? The third major conversation of the film happens in a lavish hotel room that Jesse and Celine stay in, intended for a romantic getaway. And there’s just no sugarcoating it — it is a vicious, protracted fight between the two that goes on and on, as those long-simmering tensions bubble over and they say all the things you never should say to your significant other, the things you know will cut the deepest. It feels uncomfortably real, even following the rhythms of a bad fight — how things will plateau a bit and you think you might be done, but then someone says something and then it starts up all over again, even worse than before. After the long, graceful takes of the rest of the film, Linklater opts for quick, angry cuts, treating the couple like combatants. It is well-acted, insightfully written, and really hard to watch; I felt like I went to see a romantic comedy and a John Cassavetes film broke out. We’ve developed such affection and goodwill towards this couple, rooted for them for so long, that to see them turn on each other like that is heartbreaking. But, ultimately, what “Before Midnight” is doing is putting us in the same position with Jesse and Celine that they are with each other. The romantic idealism has evaporated, and now we see them for who they are — real, deeply flawed, sometimes selfish people. Can we still love them? “Before Midnight” is a powerful film because it plays on our long-standing affection for these characters, daring to take them into much darker emotional territory than we expected them to go. Delpy and Hawke (who collaborated with Linklater on the screenplay) know these characters so well, and are able to add those shadings while staying true to their essences. Jesse is still talking philosophy, still writing stories, but has settled into something of a middle-aged poseur. Celine is quick-witted and sharp as ever, but perhaps too quick to let her cynicism get the better of her — believe me, you never want to be on the receiving end of a withering look for Delpy. The hard-won truth of “Before Midnight” is that there’s no “happily ever after” — making a relationship work is still work, and maybe the work gets harder as the relationship goes on. Things seemed so much simpler on a train ride in Vienna, when all things seemed possible for two 23-year-old romantics. But we still root for them. We still love them.